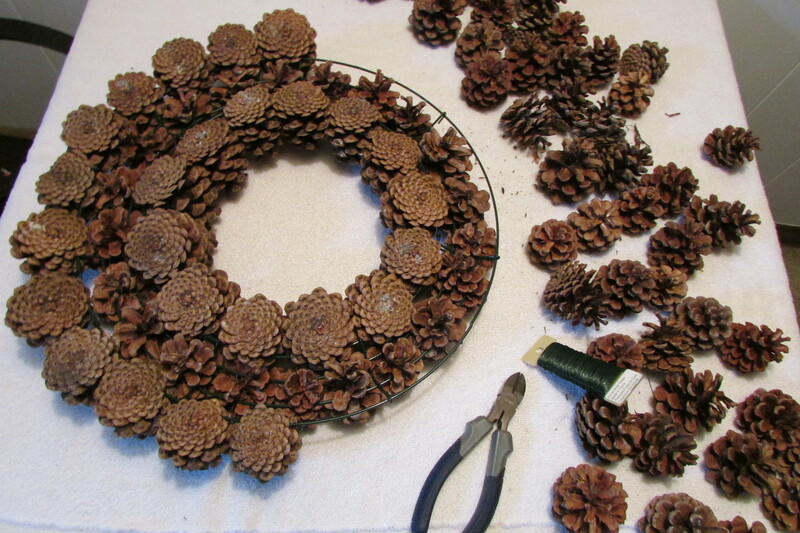 Step-by-Step instructions for How-to Make a Pine Cone Wreath. 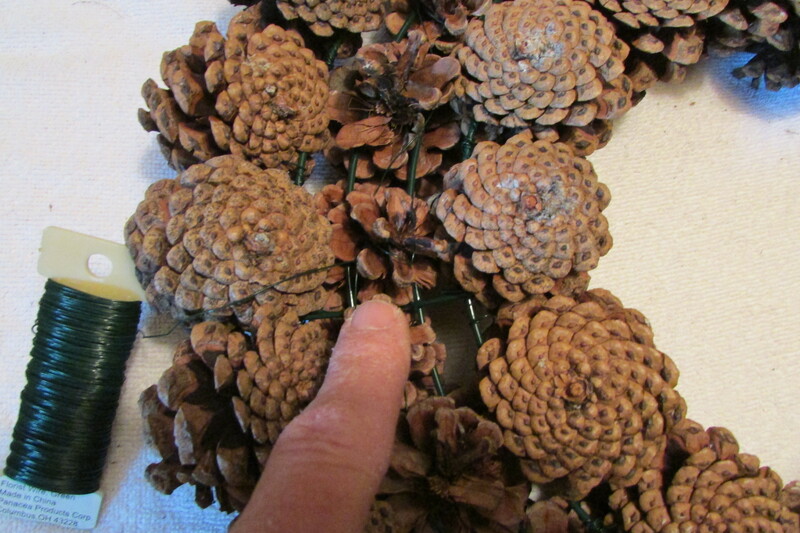 (A) ..Cut berries from picks (as seen in the photo) and attach florist wire to them leaving about 6 inches of wire to attach to wreath. (B) ..Wearing safety glasses drill a hole through the base of each nut. 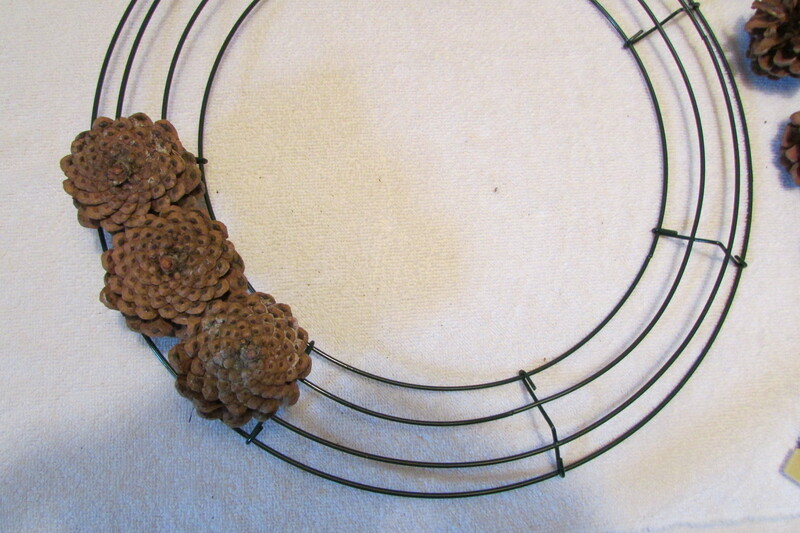 Pass florist wire through holes, and wire as berries were done, leaving about 6 inches of wire to attach to wreath. 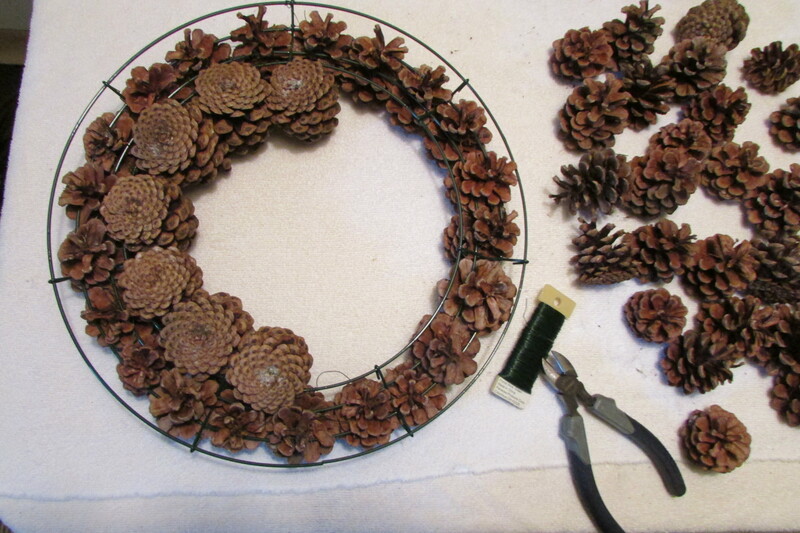 If you are good with a hot glue gun you could possibly attach the berries and nuts to the wreath using it, instead of doing the wiring and drilling. 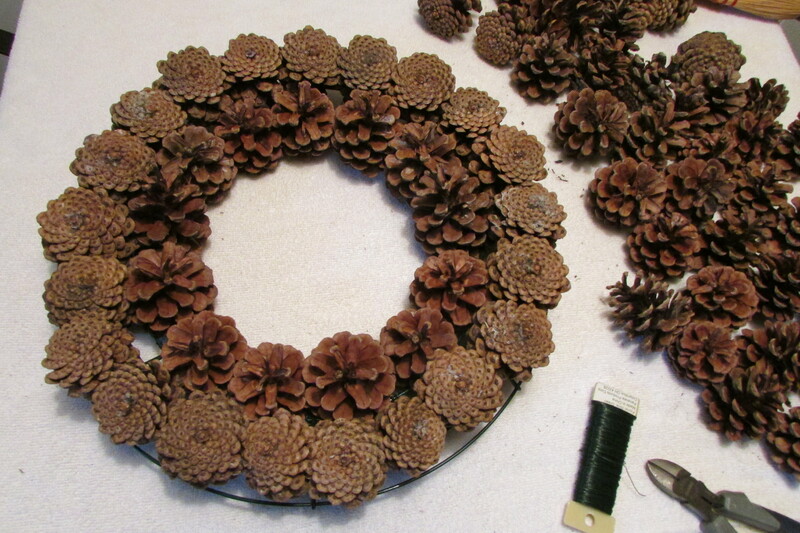 After attaching the pine cones to the wreath base, no matter how tightly you positioned them, there will be spaces, here and there, between the cones. Take you nuts and berries and use them to fill in empty spots. 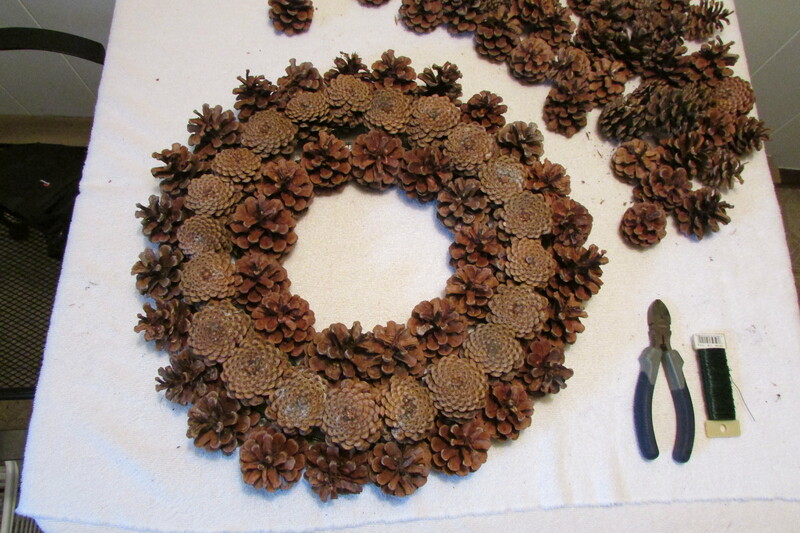 Try to place things a bit symmetrically when you lay out your nuts and berries. 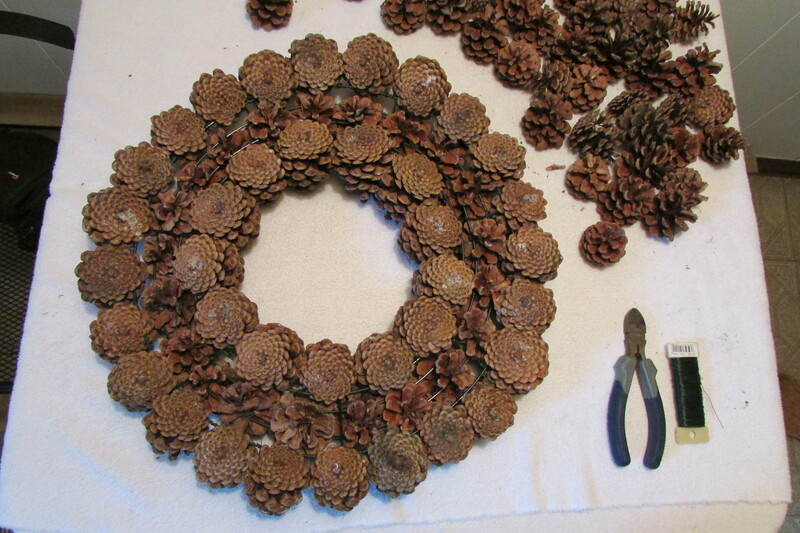 Before permanently wiring or gluing berries and nuts to the wreath do a dry run to see what looks best. 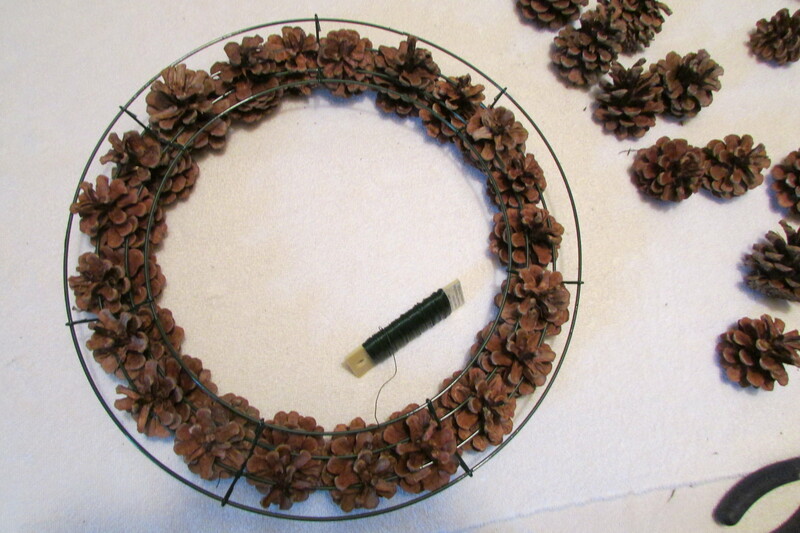 When you finally get your berries and nuts where you want them, pass the florist wire through the wreath to its back side and wire the berries and nuts to the tops of the cones that form the center of your wreath. 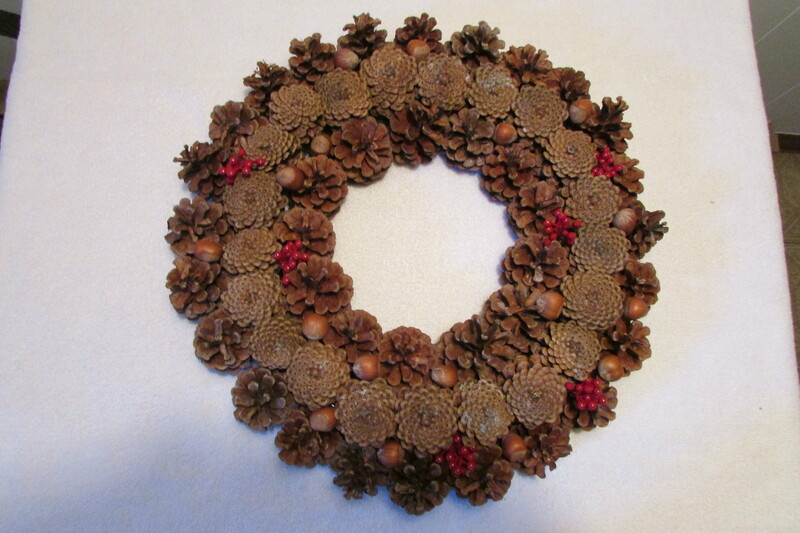 Next look at the three photos showing my wreath with no bow, but berries and different kinds of nuts on it. Each one has a different look. 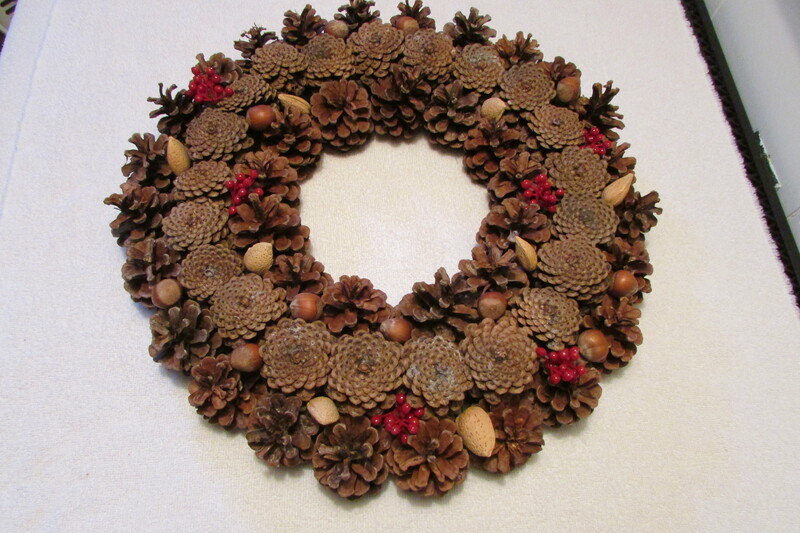 Here hazelnuts and berries have been used (the wreath looks kind of rustic and has an Adirondack kind of vibe). 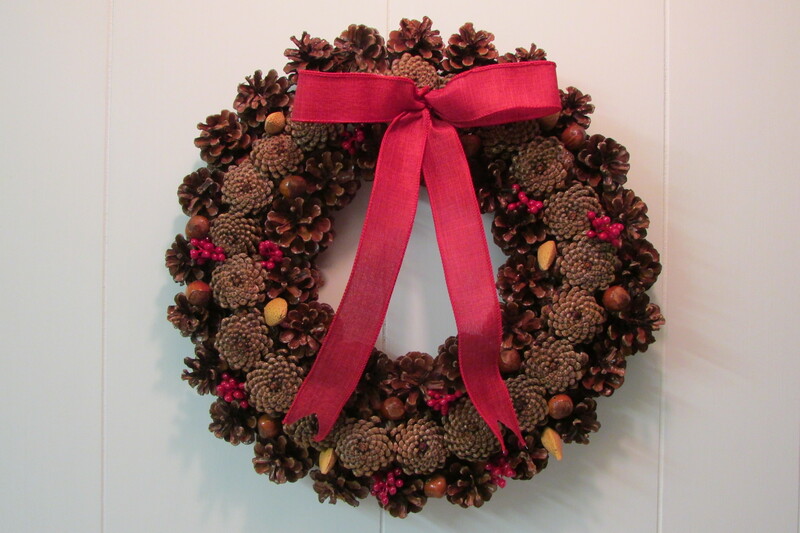 This is with berries, hazelnuts and filberts (a bit more colorful with the addition of the lighter filbert shells). 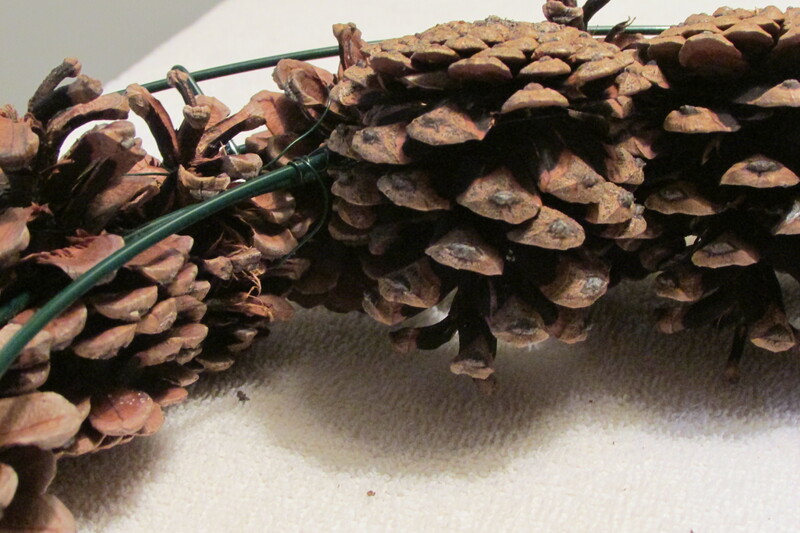 This is just berries and filberts (the filberts being a light color create a more high contrast paired with the pine cones). 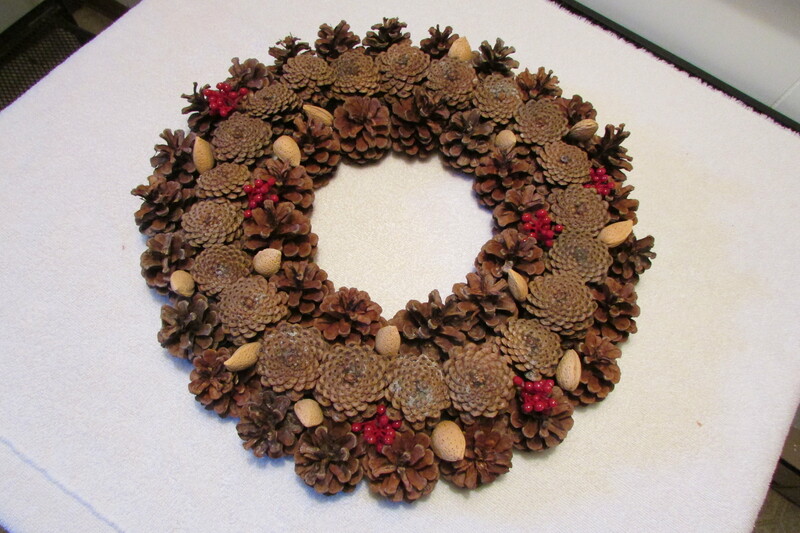 The three wreaths just shown show the pine cones and nuts in their natural colors; I would say a bit more rustic and earthy. The next picture shows it after being varnished with the Rust-oleum Crystal Clear Enamel. 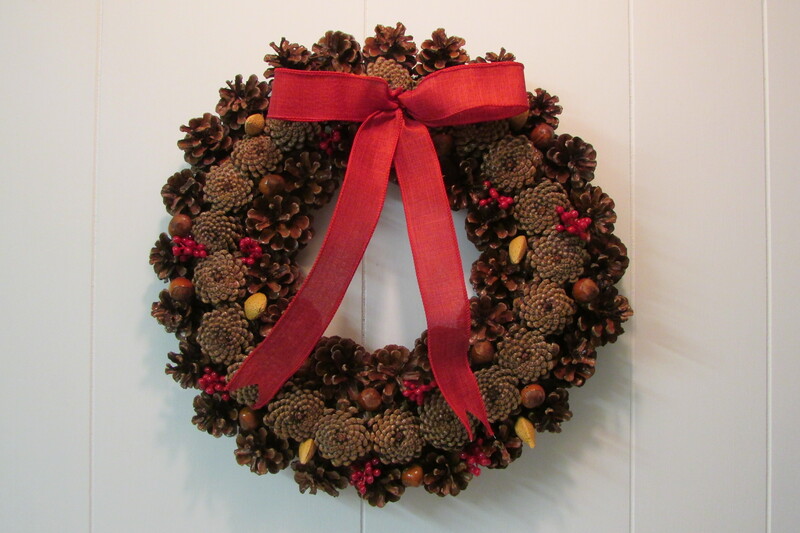 The Crystal Clear brought out all of the deeper-richer colors that the cones and nuts have, and I think protects the wreath a bit; the look is a bit more elegant and Victorian. 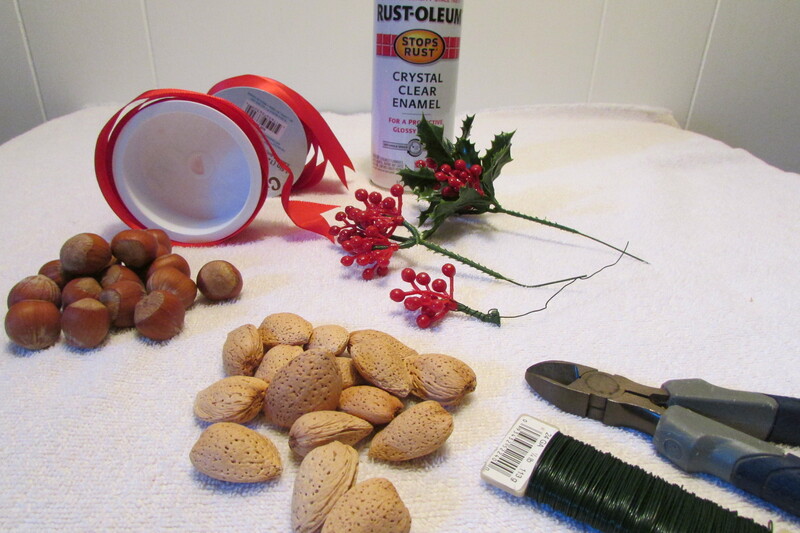 If you decide to varnish the wreath spray it with the nuts attached. 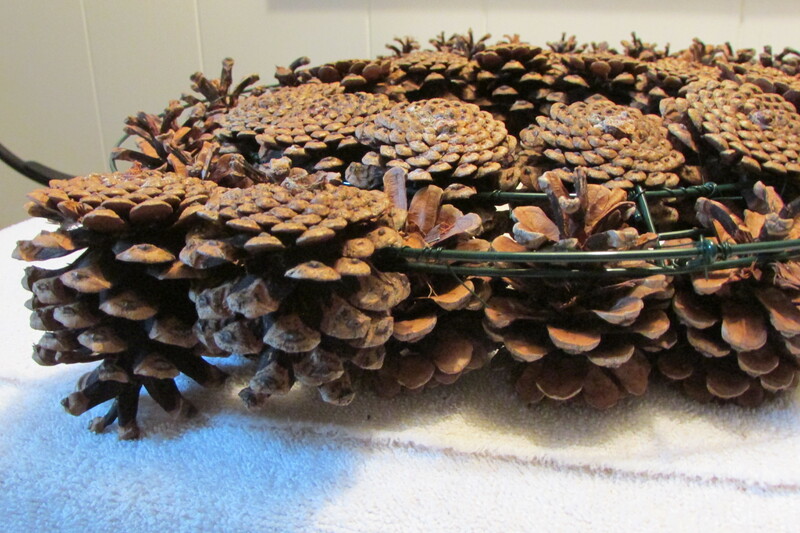 After varnishing then attach the berries and bow. Spray it first face down, so you can get the back and sides. After that (when it has dried), spray its front and sides a bit more. When I sprayed mine, I had it suspended up on some old 4×4 inch wooden blocks so it was not touching the cardboard that I put on the floor of my garage under it. 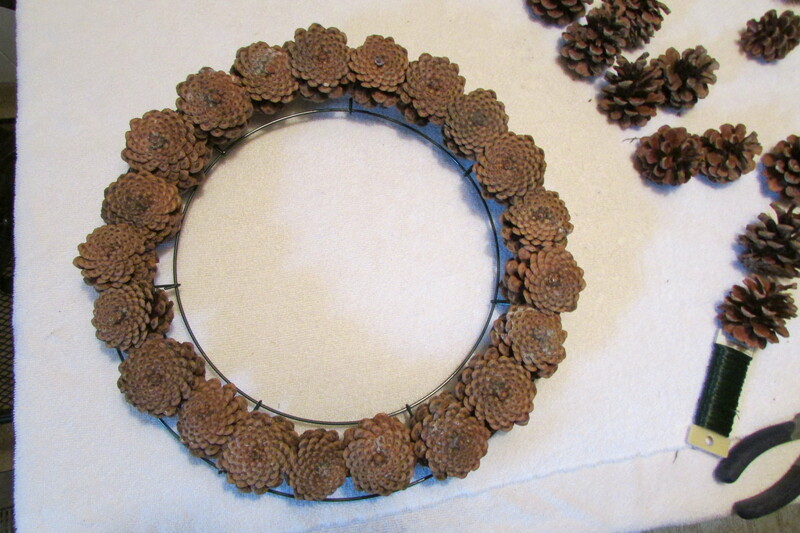 Step 6… To hang the wreath, take a length of florist wire and double it. 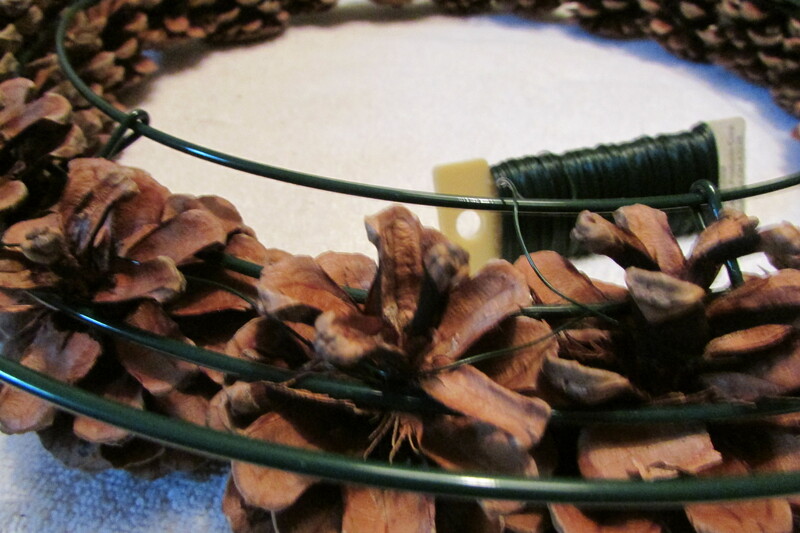 Attach it to the top of your wreath on the back center and wire it to the wreath’s wire frame. 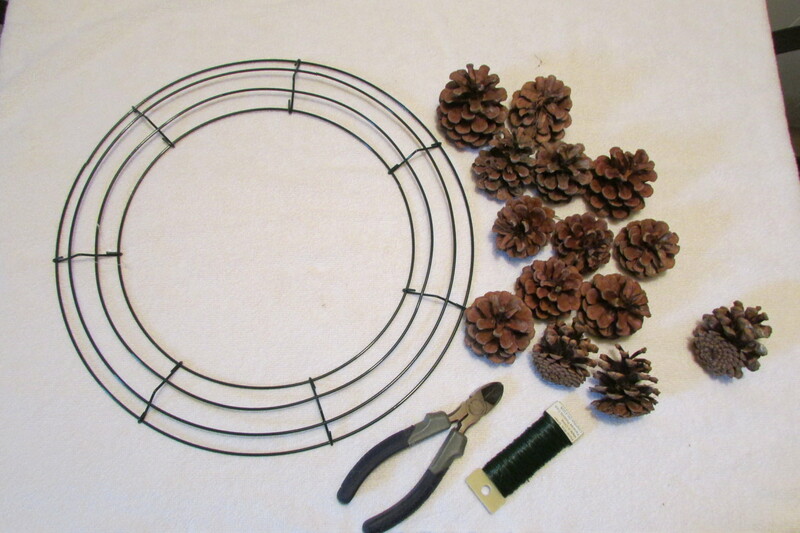 So there you have it, instructions on how to make a Pine Cone Christmas Wreath. 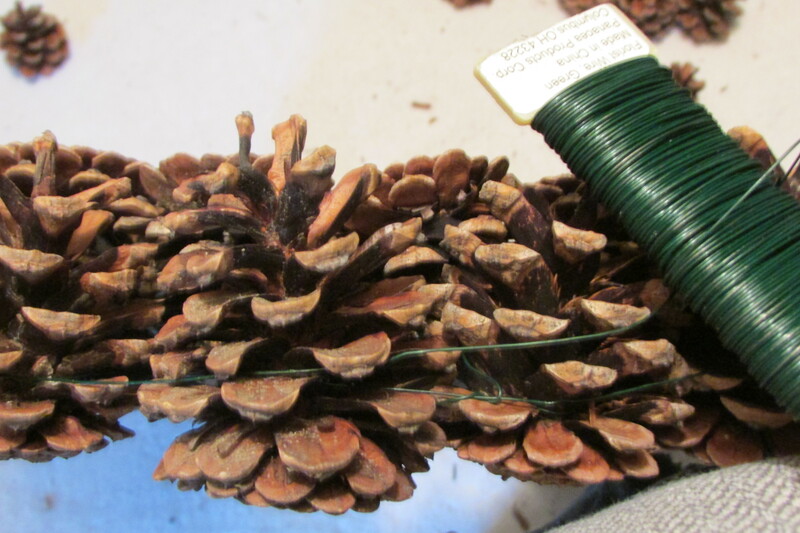 Years ago, when I did art and craft fairs, I made many of them and sold them seasonally. Making the wreath brought back happy memories of doing shows and of all the really nice/wonderful people who I came across during that period of my life. This, my 161 post, marks the 5 Anniversary of Fred Gonsowski Garden Home.com. Thanks You to all of the people who have written comments, pinned me on Pinterest, The San Francisco Chronicle, eHOW, and Face Book. Seeing that my articles on interior decorating and gardening have been read, so far, over a million and a half times by people world-wide has really been a JOY. 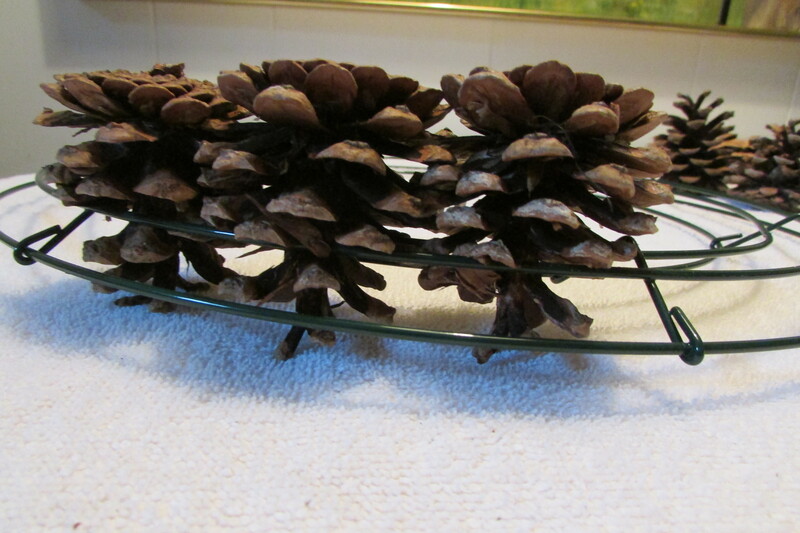 How to Decorate a Christmas Tree with Tulle 10-20-2012. 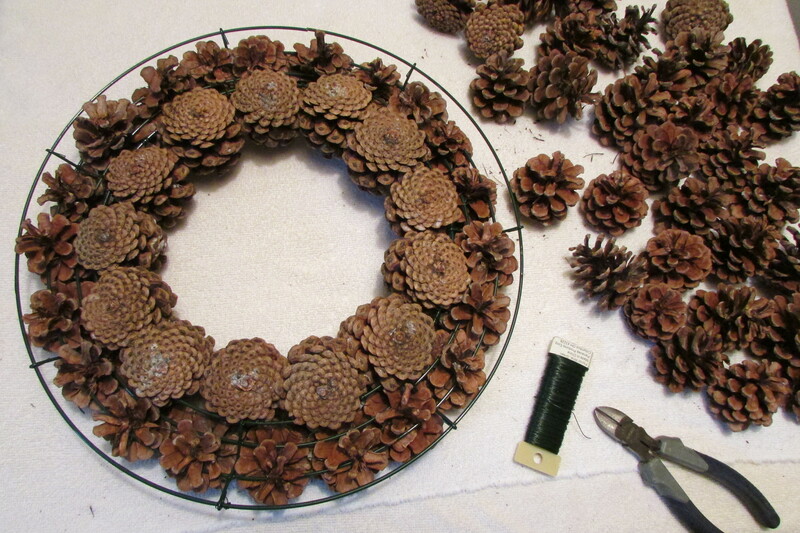 This entry was posted in CHRISTMAS / Easter, How-to, The Winter Garden. Bookmark the permalink. Thank you for all the inspiration and well-written how-to articles on your most excellent blog. I have pinned several of your Christmas articles (especially) to several of my Pinterest boards – which I know you know link back to you. (I read Cease and Desist – can’t you tell? SHAMEFUL of them!) Happy [upcoming] Holidays! Hi there Madelyn, I never have a problem with all the wonderful people who pin me on Pinterest; they are the best. The people who don’t link, I have a problem with. Madelyn you are a bit of a rare bird…For the, I think, hundreds of thousands of pins on Pinterest of my posts, only a handful have commented. But in the end, being pined is really a compliment, if the pinner writes me a note or not. Merry Christmas and the Happiest of 2016 to you! I know how lonely “message in a bottle” blogging can make one feel. After a while you start to wonder if anybody’s out there. As long as the blog is well-behaved (doesn’t slow down or shut down my browser – many do, btw, usually those with tons of ads with scripts that hang), I try to leave at least a brief thank you. Thank YOU for taking the time to comment back. As for any flavor of “stealing” – it makes me crazy! Every once in a while a link gets “blown” – but how hard is it, really, to add a link to the source? lol – it’s kinda’ like how I feel about tipping: if you can’t afford to tip, you can’t afford to eat out. May 2016 be your best year ever – and may you get gobs of positive comments. Hi there Madelyn, your comment got me looking at things from this side. First of all as of a few minutes ago I’m at 1,600,006 page views/articles read. I’ve posted 161 articles in the last five years. 68 posts of the 161 ever got comments. I’ve commented 481 times back to people who have made a comment, I try to write something to everyone. How interesting is that! I do find that when I get a comment it is most times a question. I do feel if my posts are helpful, and the person can understand what I’ve written, they probably don’t need to write anything. When a person did ask a question it was something that I did not cover in the post. In a way, the comment helped to add something extra to the piece. I do have about four hundred something followers, but most of my readers are people looking to do a certain project. I do think that some of them, once their question is answered are onto something else. I knew, right up front, when I started this blog, that no one owed me anything, and this was a project I chose to do, so if a person comments fine, and if they don’t that is fine also, and I don’t have to write something back. SO there you have it Madelyn, my feelings on the subject. That’s a wonderful attitude, Fred – thanks for sharing it. I’m thrilled for you that your stats are so high and that you are happy with that. For me, it’s not about the statistics, it’s the *relating* I seem to crave, even in a sort-of pen-pal format. As an entrepreneur who works virtually, I have spent more time totally alone than suits my extremely social temperament throughout much of my life. I have done what I did to make a difference in the lives of others – so it lights me up to hear or see that I have (thus the “message in a bottle” reference). I don’t feel they *owe* me anything, it’s just that I was raised to engage and feed back (Air Force brat -always moving – so it seemed simply “what people do”). It feels rude and/or intentional to me when large groups of others do it another way (especially when I see dozens and dozens of comments on some of the other blogs out there and sometimes none on an article I thought was fairly thought provoking and/or helpful). As long as I lived in Manhattan, social life/alone time balance was really fine. In addition, the first [html only] websites didn’t have the blog comment format ability anyway, so I already spent way too much time on email correspondence – being a pioneer in my field and one of the few who could/would answer functional questions without charge). The South is very “neighborly,” so the balance was still okay when I moved to the mid-size college town where I got my BA (and knew a few people who never left). Working “alone” actually suited me (ADD Poster Girl – highly distractible), even though the move from THE big city to a comparatively small one was quite the adjustment. Here in a slightly more northern city in Ohio it has been very strange, people-wise, especially since a series of unfortunate events with my business partners forced me to put my training arm on a protracted hiatus while I regroup. I have to pay attention to keep from slipping into depression from lack of human contact, some days. Even though I moved to a walking neighborhood with porches and sidewalks, folks tend to keep to themselves and don’t really extend to “strangers.” Frequently, even a simple smile and hello is unreturned. I don’t take it personally, but it does keep me isolated. More than a few days I have felt like one of those “living ghosts” that nobody can see (reference to that old Ghost Whisperer television show about a women who could interact with dead people to help them “move on”). So I suppose I have become more sensitive to lack of communication in the relationship vacuum that is my life these days – vacancies in the blog comment fields included. My response to your response helped me understand the dynamic and my response to it – so THANKS! Hi there Madelyn, As for blog articles with many comments, sometimes those comments are more about people wanting to see their name and comment made, versus really about the post. Some people with websites comment hoping that readers of blogs will read their comment, click on their name, and they will get traffic on their site. I also do feel that in the blog world, some people have followers that are enamored by the writer, and they want to be repetitively seen to the blog author as someone. In a way it is like someone wanting to be a friend of someone, but it is not real, but just in their mind. I also see that there are blogs where, the so called famous post things, and there are many who write comments, but the author of the post never says anything back to the commentors. I do feel comments from the blog author are a must, at least some of the time. I do know that there are blogs that get thousands of comments a day, and if a person gets that many comments, it would be impossible to comment every time. Writing a blog is really like painting a picture, it is a solitary activity. For me, at this point in time, writing the blog articles is really about letting a part of the creative process out of me, and it happens to be seen by a good amount of people world wide on this website. Hi there Madelyn, looking at your stats is the way to go. Comments are nice, but not all that important. You never know who is looking at your site. I know that a lot, maybe even all, of the big boys and girls in the blog-design-gardening-decorating-creative world have read my posts at one time or another. There is a person who is on national TV in the morning, and one day that person was doing a spot that was just too much like my post Turn your Deck Planter into a Drink Station for your next party. I posted it a year before that person presented my idea as their own. I painted my deck planter blue for a party I had here, and filled it with bottles of champagne, that I drew for the blog illustration. The TV personality painted theirs blue and had the bottles of champagne in their presentation. Red Rook Magazine used one of my posts for a piece they did. Click here is see it. If you look under Categories on the right side of the screen you will see References or Resources for San Francisco and eHow. Those venues used my posts twenty something times as parts of their articles; but never told me they were going it. I found they were doing it as I was getting track backs from those sites (How nice was that!). I have seen things written in shelter magazines that were presented just too similar to what I’ve written. None of those so called experts would ever admit to looking, but everyone, or their staffs are constantly looking all over the internet for ideas. It’s just part of life. I say to you Madelyn, just do as your are doing and write your blog as long as it interests you. Everything has its season. Some seasons are short, and others last for years. Life has its chapters, and blogging is part of your life at this point in time..
Here’s to the chapters and seasons to come – may they ALL be satisfying — for both of us.